From the high class Swedish conference resort that’s also a distillery, comes Spirit of Hven Navy Strength Gin— the Navy Strength version of their organic gin. The base spirit is wheat, and the botanicals are macerated for one day before being distilled in a copper pot still— but wait. That’s not all. The spirit is also rested in oak, but unlike the golden and aged gins you see on the market, the resting occurs prior to the final distillation. That means that it’s distilled again and the resulting spirit doesn’t have that golden oak-age signature. Vibrant nose with a lot of ethanol (it is 57%, inhale cautiously! ), with green, rooty, notes accompanied by cinnamon and cassia. Wet fir needles seem to suggest juniper, as well as a green cucumber-like note. Much greener than the regular strength offering. On the palate, green juniper, a hint of vanilla and a good deal of peppercorn notes: cubeb, peppercorn, grains of paradise, etc. Spirit of Hven Navy Strength Gin seems a distinct blend of peppery nuance that has a note of piperine but a distinct coolness that is harder to place. The finish has a touch of licorice moderated creaminess and a hint of pine-accentuated juniper. The finish is long, and predictably (and predominantly), quite hot. Flavor wise, the finish is juniper and a touch of oak chips. The flavor of Spirit of Hven Navy Strength Gin is quite interesting, with a lot of things happening and some vibrant flavors; however, it tastes disjointed and somewhat muddied to me, with the pepper and heat dominating, and the juniper never quite coming together. I like the hint of anise and licorice on the finish; however, on its own it feels unpolished. 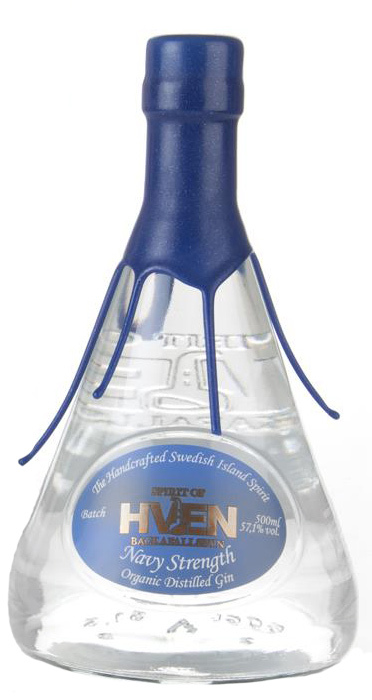 At 57.1% ABV, Spirit of Hven Navy Strength Gin is an ideal choice for cocktails. Mixed with ice or cold liquids, hints of lemon and tarragon begin to emerge. It’s good in a Gin Fizz and a Gin and Tonic, both which benefit from a fresh squeeze of lime to lighten and brighten the spirit. I thought it worked well in a range of modern cocktails, including the 20th Century and Leap Year Cocktail, while I found the Negroni to be among its most charming, wherein a peppery zing came through even at the classic 1:1:1 ratio. The intriguing unique process results in a spirit which is intellectually stimulating to ponder, but ultimately leaves me having a hard time placing it. The flavor profile is curious, but ultimately neither very gin like nor well balanced to commend unabashed recommendation to either contemporary or classic gin fans. However, it does mix well and does produce some intriguing combinations with other spirits, particularly when brightened in cocktails with fresh citrus. Overall, it’s a decent gin that has niche utility and will likely appeal heavily to those looking for unique processes and unique approaches.